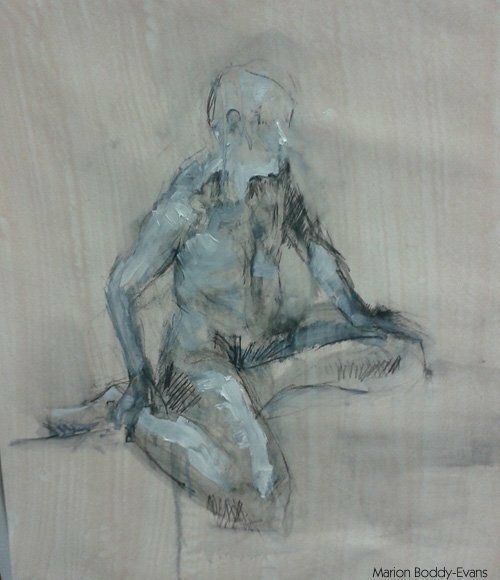 First day of Alan McGowan‘s “Life Drawing into Life Painting” workshop saw us working with tone only. 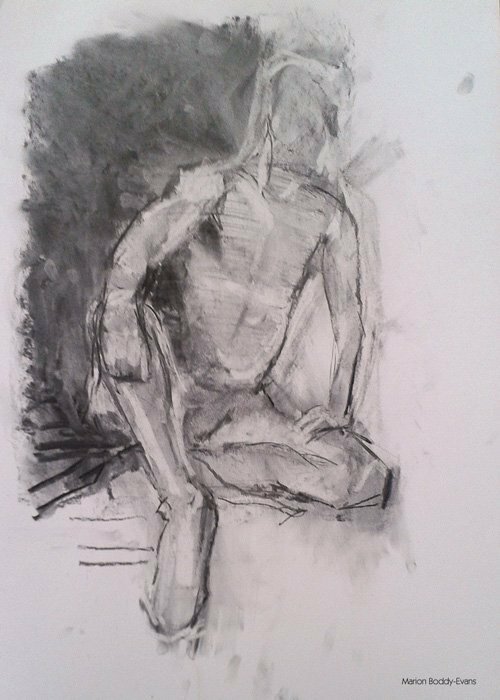 Started with charcoal, gesture line and block drawings, then longer charcoal drawing. Some proportions are awry, and needs an area of detail for focal point, but bits I like. Time was 30 minutes, I think. Next up: graphite stick, white oil paint and solvent on acrylic painted coloured ground. Graphite with white mixes to cool grey. Wiping off paint reveals warmish ground. Get highlights with white or by wiping off; darks from graphite. Start with graphite drawing, then go over with big brush with solvent, remembering that lots of graphite will turn very dark. Then smaller brush with white paint (50:50 titanium:zinc to give something with properties like lead white ie opaque where thick, transparent where thin) and cloth for lifing off. First time I’ve done this, and really enjoyed it. Loved this technique. Solvent over the graphite is like watercolour pencil, but it “dissolves” more readily and the oil paint means it stays workable, which makes the lifting off of colour an ongoing option. Time was about 45 minutes. Next up: Reductive painting technique, working from dark to light. 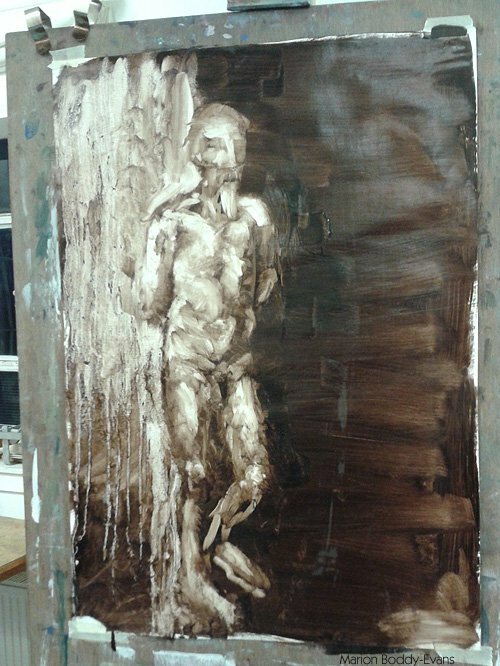 On cartridge paper primed with 50:50 PVA:water to give a less absorbent, more slippery surface, cover with dilute Van Dyck brown hue mixed with solvent and linseed oil to give an even, dark layer (not a thin, transparent, glazed layer). 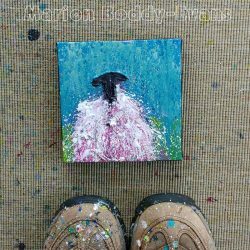 Use cloth to wipe off paint, lighter tones. Solvent on cloth will take you back to white of paper. This is a bad photo, taken under strip lights which make contrast much greater and glare on wet paint. It’s a technique that can produce fabulously subtle, gentle tones. Can’t remember how long we had, but at least an hour. Make curvier lines on gesture-drawing (armature level of drawing), not so angular. Perhaps exaggerate somewhat to counteract subsequent straightening up of figure and check angle on torso more as working. Use gesture drawing as armature, building outwards; don’t start at outlines. Don’t be so heavy handed with the charcoal, being too dark too early and harder to rework. Remember to look for lightest tones, and more variations in midtones. Limit quantity of lightest/darkest tones and it can be more effective. Put in shoulders and feet in pairs, not separately. Balance gestural markmaking with small areas of detail. Marion, I like what you are doing! It sounds like an intriguing process. Your descriptions are so good, and I like your notes to self, although you were being too hard on yourself. The drawing/painting worked as it was. Kudos! Very exciting. Can you tell which solvent and PVA you use? Svein: Any oil-paint solvent will work, what you need is something that ‘dissolves’ the paint easily without making the surface too slippery to take further graphite. We were using low-odour mineral spirits from a DIY store, the cheap kind that comes in 500ml bottles. PVA = white waterbased glue that you get in a craft shop or DIY store, also called white wood glue or craft glue. It dries with a relatively glossy surface, so diluting it with water gives something that seals the paper but doesn’t make the surface completely glossy and slick.